Give Dad the Best Father’s Day Ever! Father’s Day is right around the corner. It’s one of my favourite holidays because I love showing my dad and husband how much they mean to us. This year, I have something planned for my dad and husband. I plan on throwing them a BBQ! I will invite them over and they will unknowingly have a day completely devoted to them. Complete with a gift they will love. Here is how to give dad the best Father’s Day ever! Whether you decide on a BBQ or plan to host a formal shindig at your home, here is how to give dad the best Father’s Day ever! Make it a special Father’s Day BBQ by creating an invitation for him. Making something by hand is always special, he’ll love it. This is a great opportunity to get the grandkids involved. There really isn’t anything more heartfelt than that! Make it personalized and add a family picture. It doesn’t need to be super fancy! Just an invitation telling him to be there or be square. What else could dad love more than having a day full of grilled food? I like to create a menu ahead of time. This helps me feel more prepared for the big day. I put the menu out for everyone to see. Of course, it is filled with my dad and husband’s favourite foods. When the big day rolls around, it’s time to let dad relax. He’s not allowed to lift a finger. Whether you’re doing this for your husband or for your dad or some other important guy in your life, they’re going to love it. It’s clear the men in our lives spend a ton of time caring for us and this is their day. I do what I can to make sure my dad/husband don’t lift a finger. Of course, grilling is an exception. If your dad just doesn’t like to sit still and you need to get him out of the house for the day, here are some ideas. Take dad golfing, fishing, or on a hike. Let him spend some one on one time with nature. Take dad out for a drive or watch a movie with him. I can guarantee that the #1 thing your dad wants to do on Father’s Day is spend time with you! No doubt that my favourite place to shop for Father’s Day is at Best Buy. Everything you could possibly want to buy for one person is available there. Here are some of my favourite gift ideas for dad. If your husband or dad love to grill, they’ll love a brand new portable grill like the Napoleon BBQ grill. The best part though, is that there are so many options to get. You can see all of the items in the picture above and even more in Best Buy’s Father’s Day gift guide. Chromebook- Think of everything dad could do with a new Chromebook! Samsung Galaxy Tablet – Perhaps the dad in your life needs a new tablet. Samsung Smart Watch – Why not? This watch literally does everything! Jaybird Headphones – As much as dad loves you, he may want a little peace and quiet from time to time. 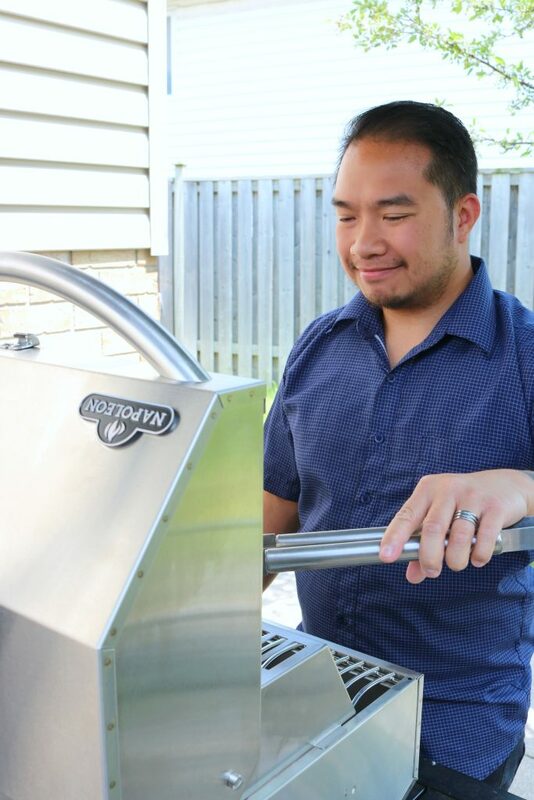 Napoleon BBQ Grill – Um, I think I know what my husband is getting for Father’s Day! Since Darasak loves to grill, he was over the moon with his early Father’s Day gift. The grill is small and mighty but, it features a high heat 14,000 BTU ceramic infrared burner and heavy gauge stainless steel cooking grids to deliver a superb sear. It offers 215 sq. in. of cooking surface, enough to grill up to 15 four-inch burgers. Of course, we are inviting our dad over to enjoy a delicious meal, good drinks and great conversations. All they have to do is relax but, Darasak insists on manning the grill. I can’t say I blame him, it’s a beaut. Whatever you decide to give dad, make sure it’s something he will enjoy. Hopefully this list gives you a little inspiration and if you’re a dad reading this, I hope you see something you like! To help you give the dad in your life the BEST day ever, I’ve teamed up with Best Buy to give one lucky Whispered Inspirations reader a $50 Gift Card! The contest opens on June 15 and closes on June 30. Open to Canada only! Don’t forget to check out all of the other Father’s Day Gift Ideas from Best Buy! You can easily give dad the best Father’s Day ever by doing a few special things for him too. Remember, it’s always the thought that counts. Do you have any tips for making this the best Father’s Day ever? Previous Post: « Love Your Legs: How to Prepare Your Legs for Summer & the Outfits to Show Them Off! I would like to choose the samsung smart watch. The Jaybird headphones is something he would love! We are in need of a new BBQ badly, so the Napoleon grill would be it. Cannot go wrong with chocolate cake! For Father’s Day – I would like to get my hubby a new bbq. Our’s is 10 years old and falling apart. It is sad when the bbq at the trailer is better than the one at the house. Hubby could really use a new Skagen Leather Bifold Passcase Wallet – Cognac ,i love this one! The gift I would choose is the Chromebook. For my dad I would get him the Fitbit Alta HR Fitness Tracker with Heart Rate Monitor as he does a lot of walking and it would be great to track it. The gift I would choose to purchase from Best Buy is the Helly Hansen 50L Waterproof Duffle Bag. The waterproof feature is essential in our rainy BC weather. I think I’d get him the Samsung Smart Watch, and the watch the fun begin (he doesn’t even have a cellphone, haha). The Chromebook is a terrific idea. I love the Skagen Leather Bifold Passcase Wallet – Cognac.Didn’t know they sold wallets! The Chromebook would make a perfect gift for my husband. I would love the smoking gun from Breville. It looks super cool. Napoleon BBQ would be nice gift for Father’s Day! I know that hubby would love a Samsung Smartwatch! I would get the samsung galaxy tablet for my Dad! I’d love to get a new tv from BestBuy for hubby! My dad would love the smart watch! He would love the Samsung Gear S2 Classic Smartwatch with Heart Rate Monitor. I would get him a FitBit. He’d love a new tablet. I think the Skagen Leather Bifold Passcase Wallet would make a great gift. I would choose the smart watch . I would love to get the Samsung Gear S2 Classic Smartwatch with Heart Rate Monitor for my dad. I would choose the camping gear…tent. I would choose the Chromebook for my husband. He could use that. Great gift. I think any dad would enjoy any of these gifts. You can’t go wrong with electronics. I think a day of not having to lift a finger and some kind of experience is the best thing you could give any dad. Thanks! I agree. Electronics is always a safe bet! My husband love to grill out and never wants anyone touching the grill but himself. That includes Father’s Day. I will make an ice cream cake for him which is what he always wants. Yep, grilling is an exception! These are all great ideas! My step dad can’t just sit and relax though, so matter how many times we tell him to! He has to be in the action all the time! Hehe, that is so funny! I know he’d love a Napoleon barbecue! I would love to give my dad a laptop but this time I have to settle with a FitBit for him since he loves his walks. My husband would enjoy any of these gifts. When it comes to grilling, he won’t allow anyone else to man the machine. I wuld choose a Samsung Tablet. My husband has oe but he uses it so often, the battery doesn’t hold a charge for long anymore and he could use an upgrade. I’d get him a smart watch. I think my husband would love the Samsung Smart Watch! my husband would love a new Barbie….and I don’t mean doll! he is always complaining about not enough heat for a really good steak on the bbq we own now. Definitely a Chromebook, Dad’s old desktop computer is obsolete and so slow, he could definitely use an upgrade! The Samsung Smart watch looks like a lot of fun. My husband is an amazing father and deserves nothing but the best! I wish I could give him the moon and more. I would choose the Samsung Galaxy Tablet as a gift for my dad. That Samsung watch is pretty neat! he could use new headphones and the Jaybird X3 Wireless In-Ear Bluetooth Sport Headphones look great! Hey! Great ideas you have here. My three boys and I are preparing a surprise grill party for my husband! I’d get him a new tablet. It would be great to get Dad a Chrome Book and try to get him to learn how to use it! Any of it would be great – you’re right, just being pampered makes it a great day. My dad would get a lot of use out of the ASUS C201 11.6″ Chromebook. He doesn’t own a laptop computer & now that he’s retired he could use this at home to browse, online shop, etc. I would defeinately choose the BBQ for my Dad as theirs is old and they really do need another one. My husband got a new Texas Rangers shirt for Fathers day. He even got to go to the game yesterday too. He is an amazing father to my kids. I would get my dad a google chromecast from bestbuy I think he would like it. I’d go with the Samsung Smart Watch. My hubby would love a smart watch. I would choose the Dyson V6 Cordless Stick Vacuum, my dads is ancient! The Samsung Galaxy Tablet would be a great gift for my dad. I would love to get my husband a Chromebook. He’s wanted one for a while. I would choose the Samsung Galaxy Tablet for my dad. I’d get this laptop . If I was picking for hubby I know he would like a new wireless speaker. I would choose the Chromebook because my dad would love to be able to use it anywhere. I would get a fitbit for hubby. The samsung smart watch looks cool! A new pair of headphones would be perfect! I’d get this laptop: . My hubby would love a Samsung Galaxy Tablet. My dad would love a samsung tablet. I would choose the Samsung Smartwatch for my husband. samsung smartwatch. my dad would love it since he fell in love with the fitbit that has no gadgetry whatsoever on it. He’d love a Samsung tablet. The samsung Galaxy tablet looks wonderful. we could really use that great looking bbq in your picture. Another item i could really use is the Fellowes Powershred 11-Sheet Cross-Cut Paper Shredder since mine recently broke! Google Chromecast would be another great idea too! The Chromebook is my choice. He’d love a smart watch. I’d get this laptop – . The Samsung Smart watch would be a huge hit here. I think he would love the drone shown,he’s a big kids at heart! I know that he would like the Samsung Galaxy Tab E 9.6″ 16GB Android 5.0 Lollipop Tablet – White as he dropped his and now it isn’t working properly. The Jaybird Headphones would definitely be another good pick for my hubby. My hubby would definitely appreciate a ChromeBook. The Samsung tablet looks good. A drone would be exciting for my husband. My hubby would love a fitbit. Samsung Galaxy Tab E 9.6″ 16GB Android 5.0 Lollipop Tablet is another item hubby would love ! My Dad would probably like the Boss Audio MR4.3W 200-Watt Indoor/Outdoor Weatherproof 3-Way for his patio. The samsung Smart watch looks amazing. My hubby would definitely like the Chromebook. The samsung Galaxy tablet would be on the top of any list. Some new grilling gadgets or tools would work for my Dad like the Weber Original GOURMET BBQ SYSTEM POULTRY ROASTER. I’d choose the Chromebook, looks very cool! The Samsung Galaxy Tablet would be so useful for my parents to have when they’re out at their campsite! This would make a wonderful gift! I’d get Dell Latitude E7470 14″ FHD Notebook – i5 6300U, 8GB DDR3, 256GB SSD, Win 7 Pro. I know that hubby really wants some kind of roku device. Wireless Speaker of some sort would work for my hubby! He would surly love the Chromebook. I’d get Dell Latitude E7470 14″ FHD Notebook – i5 6300U, 8GB DDR3, 256GB SSD, Win 7 Pro! I don’t think a grill would be a good gift for my dad. he never grills, my brother does. Dad would want the Chromebook the most. Being able to get him a Samsung Galaxy Tablet would be amazing! The grill would make a great gift. Would LOVE to put it towards a new HP Stream 14″ Laptop !!!!! A tqblet wod be super useful for him to have! The Samsung Tablet would be on his list. It looks great. I’m having issues commenting, anyone else. I just get an error message. I would go with some headphones. I would like the fitbit alta hr fitness tracker with heart rate monitor. This stick vacuum would help our household. My husband has to do all vacuuming due to my back. WIth this I could at least do a bit of that chore. Hubby would love a new tablet. The Jaybird headphones sound really nice. I think any electronic item would be a good bet 🙂 All the men in my life love their gadgets! I’d get Dell Latitude E7470 14″ FHD Notebook. The Chromebook would be awesome. I would choose a new laptop computer! I’d get hubby a new tablet. The Samsung Galaxy Tablet is so on his list. I’d get Dell Latitude E7470 14″ FHD Notebook! That grill would be awesome. He’d appreciate a new Samsung tablet. A telescope would be cool. The Samsung Tablet looks really neat.